Currently, when using free scan to assign items to a job, it lists individual items that are serialized instead of grouping quantities. For example, I have 8 lights, when I adding those 8 lights to the job via picker, they will add as a group with a quantity of 8. However, when I add them on free scan, 8 individual items appear. This is no use when quickly pulling stuff off shelves and assigning it to a job as it makes the documents very cluttered and harder to read. So if Free Scan grouped similar items the same way the picker does, that would be great! It would be useful to show total group weights in the group headings. ie Job X has 7 different areas booked as groups. Van A is delivering 4 areas, Van B is delivering 3. I want to be sure that areas 1 - 4 and 5 - 7 are not overweight for the vans. Currently I can see that the whole job is heavy, but not what the groups individually total. allow a section for you to add a serial number to sub hired equipment. It becomes a pain when you have a large job to go through and re enter sub hired equipment so you can pull through a custom field with a serial number on. I would like a box to enter a serial number in on the allocation section. It would be great if you could control individual assets even if they are attached to a container. I have 5 microphones in a box where the box is the container. When I allocate the box the Mics also allocated. Which is great. However, this means if, on a different job, I only want two of those microphones, I cannot individually allocate them as they are attached to a parent container. It would be great if items can be individually added to a job, even when they are in a container and the rest of the items are only allocated when the parent container is scanned. Almost like an optional container? Where it's only a container when the parent container is scanned. when i change my store, i would love to see just the items in this sore. not all items in my company. it would makes it easy to see quickly whats in the store. Looking at the screenshot below, we only stock one of these particular shoulder rigs and each piece is added as a separate product with it's own barcode. All these components have been added as accessories, so by the time I get to the detail view, the specific components are in essence already allocated. It would therefore be a huge time saver to not have to allocate these again when scanning and be able to book them out straight away, as the allocation at this stage only doubles the workload for us. If there only exists one of each item, why would there be a need to allocate it? For us barcoding is mainly to make sure that all the components of a specific kit come back from the hire. I would like to be able to “Partially book out” Items, similar to checking in. There are many times when an order might partially go out ahead of the remaining items. Currently, you have to make two different line items for the same item, which doesn’t make sense. In detail view when you click action, currently it always goes to top of page so you then have to scroll back to where you were. So would be good if it could reload the page in the same place from where you were before. A comments box when in finalising job option would be useful, specifically so that whoever finalises could initial and add any relevant info, damaged/ missing kit or general comments on the project for reference. Is it possible to setup containers as a resource? It would be great if you could do this and have weight, replacement charge etc... as for any other resource. Could it also then mean that when you allocate kit to a container the system can then give you a complete container weight not just the contents. I know that I could setup containers as a product and allocate them to a job, but this would only work if you know exactly which containers you are going to use and what kit you're going to put in it. Currently one sounds plays when there is a successful scan and another broken glass sound plays when there is an unsuccessful scan, but this could be for a number of different reasons. Sometimes when scanning a large number of items in it can be easy to loose track of what has been scanned. It would be great to be able to allocate custom sounds to various scan results. For example an item that has already been scanned into an opportunity would have a different sound from an item that is not in the booking and it would save having to go back to the screen to see what the error message was, then clicking to acknowledge it and then clicking again to get the cursor back in the asset field. Ten lights are on job A. Job A ends on Monday, de-rigs on Tuesday and is back to the warehouse on Wednesday. Current shows this as a BIG CLASH and for the whole of tuesday and wednesday we appear to be ten lights short. Also, the warehouse never get the ten lights back from Job A, caution confusion when they try to scan things back in. What would be good would be an option on an item to say that that item specifically was going to be transferred on a given date/time to a new opportunity. You'd select the opportunity in this option as well, and it could even add it to the list for you. In availability view there would be some form of colour or visual indicator that showed the planned transfers. Anybody else got any thoughts on this? Thanks for the votes and comments! We’re investigating this one for future development. You assign that as the container as you scan all the cables in to it. When it comes to 'Book Out' I have to rescan all those cables...what a pain! I'd like to just scan the case barcode and everything in that container is scanned out of the warehouse. With our latest update to the detail view, you can sort by container and then tick all items in a container to book out in a couple of clicks. It would just make my life easier if people couldn't allocate and prepare items without having first scanned them. When booking out/checking in a serialised container (amp rack, kit etc. ), all serialised components are checked automatically, without popping up a list of the items being automatically checked in/out. To an *extent* this is the whole point of serialised containers, I understand. In the case of an amp-rack with all serialised components bolted into place, this behaviour presents minimal risk. I don't know the best way to handle this, but am thinking at least have an option in the admin account settings, to choose between checking in/out serialised containers piece by piece or all-in-one for that company's Current system. And/or perhaps a list pops up on check in/out, confirming the items that should be in the container/kit, and the operator must just click to confirm that all are present (prompts them to check). Just something to provide a bit more accountability? I realise the list of serialised components is shown in the opportunity screen if you scroll to the right place for the particular container you are checking in/out. It just seems a bit too easy for the operator to ignore, at present. Currently items with "stock method: None" are still checked in/out like other stock methods. I was just wondering if it would make sense to have them behave as "ghosts" that don't get checked in or out, since their quantity is not tracked anyway. Example: When we use "stock method:none" items to create packages, it doesn't really mean anything to check the package in or out since the non-stock package itself doesn't physically exist. What do exist, and of course must be checked in/out, are the constituents of that package (bulk and serialised). My suggestion is intended to remove a few unnecessary book outs/check ins for each job (small time saving). Our issue is that jobs are often de-prepped piecemeal rather than altogether, usually for reasons of demand and Prep really needs to know exactly where a piece of kit is and how far through the system it is. I would like to see a system that meant we could complete each item individually rather than being forced to do it by job. 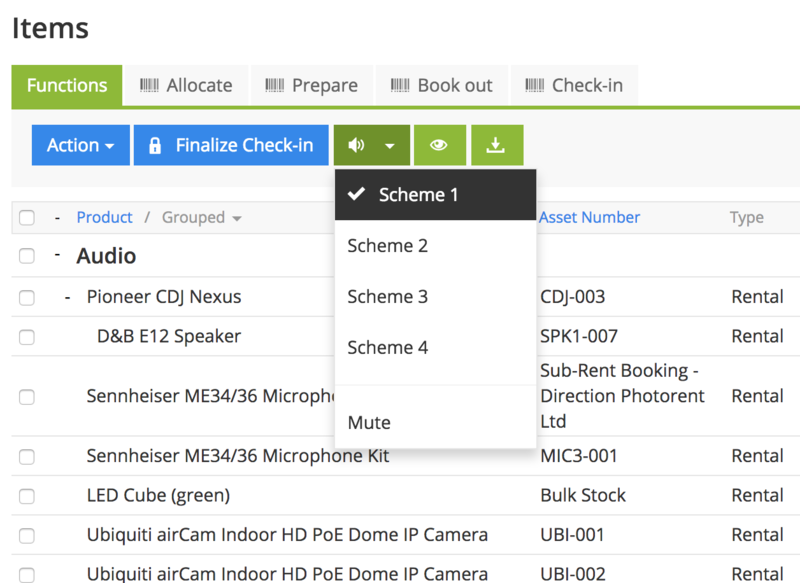 Currently, an item that is "Checked In" could be on the shelf (actually "Completed" but we are unable to mark it as such without completing everything), or it could be still on the bench in the process of being tested. When you finalize check-in, everything with the status ‘Checked in’ is marked as ‘Completed’ and will be returned to availability or moved to the quarantine based on the “Return at” date you specify on the finalize check-in screen (plus any post-rent unavailability on the product). To have some items return to availability before others, you can check-in just the items you want to return and then finalize check-in. Choose the date you’d like them to return at on the finalize check-in screen. Any items that are still reserved, allocated, prepped, or booked out will remain on rent on that opportunity. I think it would be of use to be able to say I have prepped 10 out of 25 cables listed rather than have to leave this blank and rely on memory / communication / notes and scribbles. Will there be an option to use rfid chips with the software soon? RFID is essentially a contactless bar code. While we’ve not tested any RFID readers with Current, you can use the system with most readers that operate as “keyboard wedges”. Provided the RFID reader takes an asset number from the RFID tag and translates that into key strokes, it should work with Current RMS. You can test this in the Opportunity Detail View when allocating assets. Some RFID tags may be able to store additional information that can be written to — this will not be accessible in Current RMS.